The Gardco/DIN 4mm Standard and Mini Dip Viscosity Cups are produced with an easily removable orifice of the Gardco “Snap In, Snap Out” type. Cup and orifice production tolerance permits replacement of the orifice without loss of acceptable tolerance. In accordance with Deutsche Normen DIN 53211, Gardco offers only the 4mm DIN cup and provides the ISO viscosity cups series for use on materials outside the range accommodated by this cup. The Gardco/DIN 4mm viscosity cups conform to the flow characteristics specified by Deutsche Normen DIN 53211. 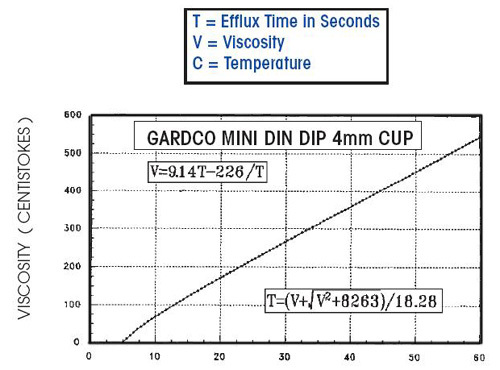 Conversion formulas and tables relating efflux time in seconds, to the nearest tenth of a second, to viscosity in centistokes are furnished with each Gardco/DIN viscosity cup. Calibration of the Gardco/DIN cups are traceable to the National Institute of Stadards and Technology. The Gardco/DIN viscosity cup is machined from solid bar stock aluminum with removable stainless steel orifice. Exterior cup dimensions are chosen to fit existing support stands for the Standard Ford and ISO viscosity cup series. Gardco/DIN cups are not matched by any other such cups with respect to the above advantages or in highest quality of workmanship or in continuing quality control procedures. The Gardco/DIN viscosity cup was designed by and is manufactured and calibrated by the Paul N. Gardner Company, Inc. The physical dimensions of the new Gardco/Mini DIN Dip viscosity cup have been chosen to provide just one half of the efflux time in seconds of the Gardco Standard DIN cup of the same number and orifice. The inverted cone shaped bottom of the cup terminating in the removable stainless steel orifice is retained to insure a sharp end point and best possible comparable accuracy. For the first time, a dip cup has been developed primarily for field use which is a direct counterpart of the cup used in the laboratory. Gardco is pleased to have made this contribution and to introduce the Gardco/Mini DIN Dip cup along with the new Gardco Standard DIN Cup Series. The Gardco Mini Dip Cup has all of the advantages listed for the Standard Cup Series except it does not have a drip ring at the top of the cup and a handle is attached for support. The Mini Dip cup capacity is one-half that of the Standard cup. The body of the cup is machined from solid bar stock aluminum. Note from the cross section drawing of the cup the relatively deep well surrounding the top of the cup which serves to catch any overflow. Note also the conical opening for the orifice which permits gentle "tapping in" or "tapping out" of the orifice. The stainless steel orifice design provides for extension between the opening in the body and the lowermost extension of the cup. This design insures protection for the orifice and prevents interference with the efflux stream by uneven or contaminated surfaces surrounding the orifice. Insure that the test material is at specified measuring temperature. Place the cup in a suitable leveled holder and place a receiving container under the cup. Place a finger against the orifice and fill the cup with the test material until the meniscus, where it joins the sidewall of the cup, disappears. If there are bubbles in the sample, allow time for them to rise to the surface. If the cup is overfilled, remove the excess by sliding the cover plate across the top of the cup. With the plate in this position the finger may be removed. Remove the finger from the orifice or pull the scraper plate from the top of the cup and simultaneously start a timer. Hold a thermometer in the efflux stream in order to accurately determine the temperature of the test material. Stop the timer at the first observed break in the efflux stream between one and two inches below the orifice. Most materials change viscosity as a function of temperature. Those normally measured by viscosity cups change in the range of 3% to 8% per degree Celsius change in temperature. Usually, the higher the viscosity the greater the change. For acceptable accuracy, it is necessary to measure temperature at the same time that viscosity cup readings are taken. When many determinations are to be made on similar products in the same viscosity range, it may be helpful to produce a graph for converting measured temperature and viscosity cup Efflux time seconds to seconds at a specified temperature, normally 25° Celsius. There are three variables to consider: Viscosity, efflux time seconds and temperature. All three can be shown on a graph with a family of curves as shown in the following example. Viscosity level is indicated by the diagonal lines, increasing from the lower left to the upper right. 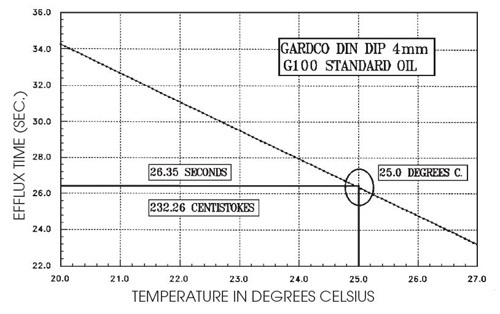 Such a graph can be prepared for a given material by taking readings with the Gardco/DIN cup over a limited temperature range, as shown in the example. Within this limited range the plots of the obtained data will normally result in a straight line such as the heavy diagonal line. Draw parallel lines to the line of experimental data, as shown, representing different viscosity levels. Enter on the graph the material represented and the Gardco/DIN 4mm designation. Use the prepared graph by plotting on it measured temperature and Efflux time seconds. At “A” in the example, these values are 26.0°C and 39.5 seconds. Read parallel to the diagonal lines to the intersection with the heavy vertical line which is 25.0°C, the target temperature. Then, reading horizontally to the left, it is found that the correct efflux time seconds at 25°C, is 41.5 seconds. Similarly, at "B" in the example, it is found that a reading taken at 23.5°C, when corrected to 25°C changes from 40.5 to 37.5 seconds. Compensating for temperature measured near to but not as specified must be with caution. Even within the limited range of ± 2.0°C the variation of viscosity with temperature may not be linear and any thinning materials used to adjust viscosity may also change the rate of this variation. Gardco/DIN viscosity cups are precision instruments. They are ruggedly constructed and, with reasonable care, will give many years of satisfactory service, requiring only thorough cleaning following each use. Particular care should be used in cleaning the orifice to avoid leaving deposits or scratches on internal surfaces. Never strike the orifice directly when removing it from the cup. Place the dowel rod furnished with the cup against the orifice and strike the dowel with a heavy object such as a paper weight. Prior to inserting an orifice into the cup, insure that the exterior of the orifice and the receiving cone of the cup are clean. It is good practice to retain a standard oil that can be used to periodically insure that the cup retains its initial calibration. Such oils are available from Gardco. Refer to the Specification Table for the oil recommended for use with the DIN 4mm cup. Gardco produced viscosity cups are calibrated with standard “G” Series oils. Centistoke viscosity of these oils is traceable to the National Institute of Standards and Technology. These standard oils, prepared expressly by the Cannon Instrument Company for the Paul N. Gardner Company, are produced in accordance with ISO/IEC 17025, ISO/IEC Guide 34, ISO 9001.
is taken from ASTM D445: Viscometers used for silicone fluids should be reserved for the exclusive use of such fluids. Solvent washings from these viscometers should not be used for cleaning other viscometers. Shown in the graph is the viscosity cup number and the standard “G” Series oil used for its calibration. Normally, cup calibration is at 25.0° Celsius, shown on the graph by bold lines intersecting with the curve in the circle. 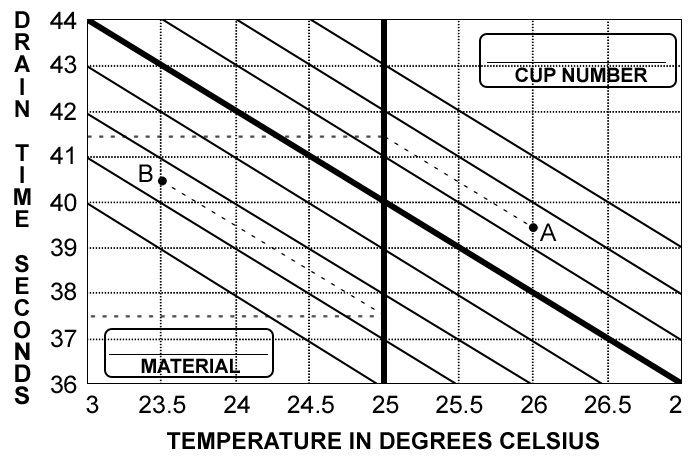 Temperature/Efflux Time Seconds Graphs for all cups in the series are included with each cup sold by the Paul N. Gardner Company. Viscosity of most liquids, including the standard oils, are dependent on temperature. Efflux time in seconds for the indicated cup-oil combination from twenty (20) to twenty-seven (27) degrees Celsius is shown in the graph. The cup may be checked with the indicated “G” oil with reasonable accuracy within these limits. For best accuracy, the standard oil label viscosity with temperature at 25.0° Celsius should be used. Conversion from centistoke viscosity to efflux time in seconds is by the formula or table furnished with the cup. This information, furnished as an additional customer service, is included with each viscosity cup sold by the Paul N. Gardner Company. 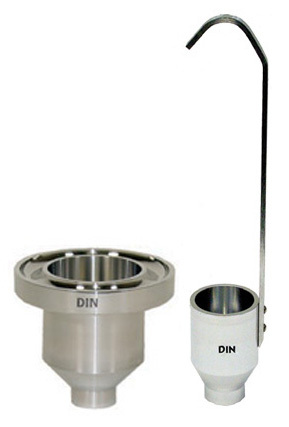 Any particular Gardco Standard DIN Cup or Gardco/Mini DIN Dip cup - orifice combination will be certified, as an extra cost service, to within 0.1 seconds and 0.1 degrees Centigrade on a standard oil selected for the combination midrange. Both the viscosity of the oil and the temperature measuring devices are traceable to National Institute of Standards and Technology. This certification complies to the requirements of ANSI/NCSL Z5401 or ISO/IEC 17025, ISO 9001 as applicable. Such certification is voided by the replacement of the cup orifice. The POISE is the fundamental unit of viscosity. It is a unit of measure of the resistance of a liquid to flow where gravity is not a factor. 100 CENTIPOISE = 1 POISE. However, gravity is the driving force causing liquid in a viscosity cup to flow through the orifice. A high density material will flow from the cup in a shorter time than a low density material of the same viscosity. The STOKE is defined as the POISE divided by density (or weight per gallon multiplied by 0.120). 100 CENTISTOKES = 1 STOKE. 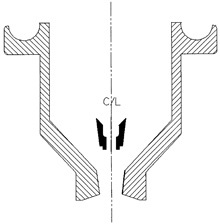 The CENTISTOKE is the unit of reference in all viscosity cup measurements. The graph relates viscosity in CENTISTOKES to EFFLUX time in SECONDS for the Gardco/DIN 4mm viscosity cup. The graph may be used for determining the rough relationship between these factors, but usually reference will be made to the table furnished with each cup that provides values to the nearest tenth of a second. If it is necessary to determine the relationship beyond the range of the table, the mathematical formulas shown in the graph may be used. The top formula shown on the 4mm DIN DIP Cup graph is used when efflux time in SECONDS is known. As an example, assume 28.9 SECONDS in the 4mm DIN Dip cup. Multiply 28.9 by 9.14 and the result is 264.15. Divide 226 by 28.9, which is 7.82, and subtract this value from 264.15. The result is 256.33 CENTISTOKE for 28.9 SECONDS efflux time from this cup. The lower formula shown on the DIN DIP Cup graph is used when the CENTISTOKE value is known. As an example, assume 317.0 CENTISTOKES in the 4mm DIN Dip cup. Square 317 which is 100,489 and add 8263 for a total of 108,752. Take the square root of this value, which is 329.8 and add 317 for a total of 646.8. Divide 646.8 by 18.28 and the result is 35.4 SECONDS, efflux time for 317.0 CENTISTOKE viscosity material from this cup. The lower formula shown in the graph is used when Efflux time SECONDS is known. As an example, assume 45.0 SECONDS as the cup Efflux time. Multiply 45.0 by 4.57 and the result is 205.7. Divide 452 by 45.0, which is 10.0 and subtract this value from 205.7. The result is 195.7, the CENTISTOKE value of 45.0 seconds Efflux time from this cup. The top formula in the graph is used when the CENTISTOKE value is known. As an example, assume a viscosity of 250 CENTISTOKES. Square 250 which is 62500 and add 8263 for a total of 70763. Take the square root of this value, which is 266 and add 250 for a total of 516. Divide 516 by 9.14 and the result is 56.5 SECONDS, the Efflux time of a 250 CENTISTOKE material from the Gardco/DIN 4mm Cup. Flow characteristics of all Gardco produced viscosity cups are accurately defined by mathematical formula relating their Efflux time to the viscosity of standard oils which are traceable to the National Institute of Standards and Technology. 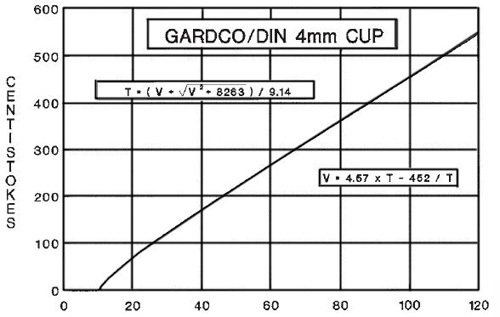 The formula for the Gardco/DIN 4mm cup is shown in the conversion graph. For convenience, the formula has been solved for each tenth second within the normal cup range. The resulting table is furnished with each cup and is shown here in reduced form. As an example for the use of the table, assume a cup Efflux time of 66.7 SECONDS. Read down the left column to the 66 SECOND line and then to the right on this line to the 0.7 column. The value at the intersection is 298.0 CENTISTOKES. 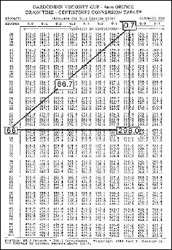 The table may be read in reverse to find Efflux time SECONDS from a known CENTISTOKE value. 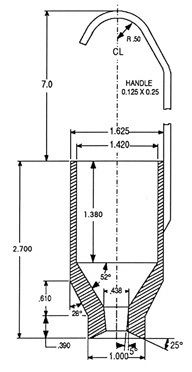 The Gardco/DIN viscosity cups are in close agreement with the internal dimensions specified in DIN 53211 but with the following improvements: The mass of metal has been reduced to a minimum adjacent to the orifice for smallest possible temperature influence when cup and test material are not at the same temperature. The stainless steel orifice is of the readily removable type permitting replacement without significant loss of accuracy. The design of the cup and orifice eliminate hard to clean recesses. For greatest possible user convenience, the outside dimensions of the cup have been chosen for accommodations by support stands commonly in use with either the series of Gardco Standard Ford viscosity cups or the series of Gardco / ISO viscosity cups. In addition to physical improvements, the Gardco/DIN cups are furnished with conversion formulas and a copyrighted table which relates the nearest tenth of a second of efflux time to viscosity in centistokes. The table is particularly useful in determining efflux time in seconds when viscosity in centistokes is known. As an additional service, the Gardco/DIN cups may be ordered with a Certificate of Calibration which contains calibration data with the use of oils traceable to the National Institute of Standards and Technology, and a calculated correction factor, if any, that may be used with the cup. Such viscosity cup certification procedures and conditions comply with the specifications of ANSI/NCSL Z540 or ISO/IEC 17025, ISO 9001 as applicable. The Gardco/DIN viscosity cups are produced to very close mechanical tolerance in elaborate jigs and fixtures. Such production procedures and equipment not only insure that each cup is correctly produced but also that all cups are identical. The body of the cup is machined from solid bar stock aluminum and the orifice from stainless steel. Production tolerance on the Gardco Standard DIN cup and the Gardco/Mini DIN Dip cup and the orifice is sufficiently close to permit interchange of orifices between cups. For convenience and for best possible results, however, it is recommended that such interchanges be held to a minimum. The orifice for the cup is machined from stainless steel with the exact conical exterior to match the opening in the base of the cup. The information contained herein, or that supplied by us or on our behalf in any other manner is based on data obtained by our own research and is considered accurate. However, NO WARRANTY IS EXPRESSED OR IMPLIED REGARDING THE ACCURACY OF THESE DATA, THE RESULTS TO BE OBTAINED FROM THE USE THEREOF, OR THAT ANY SUCH USE WILL NOT INFRINGE ANY PATENT. This information is furnished upon the condition that the person receiving it shall make his own tests to determine the suitability thereof for his particular purpose.